Add breathtaking, feminine style to your look with this stunning locket! 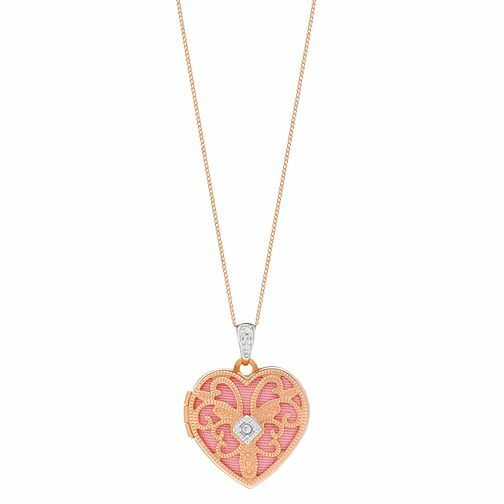 Set on an 18" chain and crafted from romantic 9ct rose gold, this beautiful heart shaped locket features intricate cut away filigree style detailing revealing a pretty pink interior, and has a glittering diamond set at its centre along with glamorous diamond detailing on the bail. 9ct Rose Gold 18" Diamond Set Filigree Heart Locket is rated 3.0 out of 5 by 2. Rated 1 out of 5 by Anonymous from Second hand goods The locket was for a wedding present to my bride to be . What a shock when I opened the package. Firstly the gift box was nearly flat and looked as though it had been used several times before !! Then when I looked at the locker it was badly presented in a tiny box , I took it out the box to gave a look at it and it that badly tangled it couldn’t have possibly been worn by by my new wife . It had definitely been worn before and took back . Luckily there’s a a shop ten mile away that replaced it for me .